Glaring aureate self-winding mechanical watch that is made of high quality stainless steel, suitable for daily wear. Bling-bling rhinestones decorated on each hour markers. Glaring aureate watchband, which is very luxury and shining. 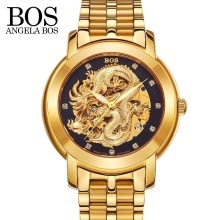 Chinese dragon adorned at watch dial, glorious and powerful. Self-winding mechanical movement that has elegant and exquisite technology. 30 meters daily life water-resistant(not for showering, swimming and snorkeling).